Active at Altitude, organizers of the 2018 US Trail Running Conference has announced a sponsorship agreement with Tour San Marcos. The first destination marketing organization to take part in the US Trail Running Conference, Tour San Marcos will sponsor a lunch and a keynote speaker session during the industry leading event. The sixth annual edition of the US Trail Running Conference takes place in San Luis Obispo, California, on August 29-31, 2018, and is presented by the City of San Luis Obispo, CA, and Race Roster, the fastest growing endurance registration website in North America. The Conference is also held in partnership with the American Trail Running Association, and Race SLO. 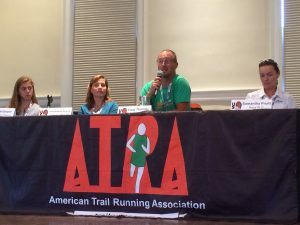 Tour San Marcos were an exhibitor for the 2017 US Trail Running Conference, using the opportunity to connect and network with trail race directors and trail runners from 20 states across the US, as well as from Canada and the Azores. Representatives from Tour San Marcos were successful in sharing information on the many opportunities that San Marcos provides for both trail race directors looking for new or alternative locations for the rapidly growing sport of trail running, as well as for running and active vacations for trail runners. San Marcos has been a favorite destination for more than 12,000 years, having been the home of the Clovis Indians, the oldest known inhabitants of the western hemisphere. With a population of more than 60,000, San Marcos boasts a unique multicultural heritage and history where Hispanic, African-American, German, Anglo and other cultural influences are a part of everyday life. In a 2017 report from the Outdoor Industry Association, Texas has the third largest amount of consumer spending generated by the outdoor recreation economy in the US, at $41.8 billion. Registration is open for all trail race directors, trail runners, sponsors, and exhibitors. See www.ustrailrunningconference.com for more details, or contact Event Director, Terry Chiplin, terry@ustrailrunningconference.com, or 303-304-9159. This entry was posted in active at altitude, cvb, dmo, race roster, race slo, san luis obispo, slo ultra, tour san marcos, trail race directors, trail running, trail running conference and tagged atra, race roster, race slo, rcae slo, san luis obispo, share slo, shareslo, slo ultra, tour san marcos, trail conference, trail running. Bookmark the permalink.